Famous Military Icons. Famous People from Bolivia. Bolivian Celebrities. The following are some famous military icons in Bolivia. You can read about more famous Bolivians by visiting our Famous People from Bolivia home page where you'll find many other categories. You can ask questions about any famous Bolivian person or add another famous person from Bolivia. A military man born in Concepción (Santa Cruz) in 1921. He studied at the local Military School and then in Argentina, and worked as an instructor of the La Paz Military Academy until he was called by the government to be the Minister of Education. In 1971 he led a coup and installed himself as president for seven years, making him the longest-running dictator in Bolivian history. Pressured by the people, he called for elections in 1978 and stepped down. He then founded the Acción Democrática Nacionalista (ADN) political party and was elected president in 1997 making him the only former dictator to have been democratically elected as president. He died of cancer in 2001 while still president. A famous military man, born in La Paz in 1814, he was one of the best of his time and the right hand of various Bolivian presidents of the newly independent Republic such as Santa Cruz, Velasco and Ballivián under whom he had served in the wars against Peru. However, his best performance was in the War of the Pacific against Chile. Despite his age, he commanded a division and was killed in combat along with the emblematic “Colorados” Battalion in 1880. Born in San Javier (Santa Cruz) in 1904, he was trained at the local military school. Despite his youth he commanded Bolivian army battalions in the Chaco War and was best known for his actions in the Battle of Boquerón. He was charismatic man and along with a military junta he staged a coup and took the presidency in 1936. However, he called in the National Assembly and was constitutionally elected as president become the second youngest president after president Sucre. He made constitutional reforms that put the government in charge of all natural resources and other reforms to benefit the lower classes. However, he was unable to implement all his plans as he died under mysterious circumstances in his office in 1939. Some say it was suicide, others assassination. Of Venezuelan origins, he was born in 1795 to a family of noble blood in Cumaná. He became involved in the independence movement whilst still an officer cadet in his teens, and became Bolivar’s best field commander and right hand, going with him to win freedom from Spain for his native land, Ecuador, Colombia, Perú and Bolivia. His victories against royalist forces at Pichincha and Ayacucho sealed the fate of the Crown’s colonies, the latter being the battle that liberated Perú and Bolivia definitely, and for which he was promoted to Field Marshal, the youngest in the patriot armies. Later he’d be Bolivia’s second president, and for two years, he dedicated himself to organizing the political, educational and social institutions, also creating law codes and a Constitution, until he resigned and returned to his country. He was assassinated in a mysterious ambush as he traveled alone through the mountains of Berruecos, in Colombia. Born to a Spaniard royalist commander and the daughter of an Aymara cacique in the town of Huarina (La Paz) in 1792, young Santa Cruz followed his father’s steps and fought as a lieutenant (later lieutenant colonel) in the Spanish forces against the patriots of Bolivia, Perú and Argentina during the Independence Wars, and was made prisoner twice. He had a change of heart during the second of those captures, and decided to join the patriots, first with San Martin and then Sucre. After independence was achieved, he became President of Perú in 1826, and then of Bolivia in 1829, remaining in office for one decade. As President, he promulgated the country’s second Constitution, and five of the most important law codes as well as founding two state universities. He also unified Bolivia and Perú to form the Bolivian-Peruvian Confederation, which was met with opposition from inside and outside, leading to a war with Chile that he lost, and that meant lifelong exile to Europe. He died of natural causes in France. Born in Spain in 1775, this career officer had been a military government official until he made a name for himself as commander of the rebellious militia in the first independence attempt of the Colonies in Charcas (Sucre) in 1809 that overthrew the Spanish viceroy. Escaped from a long capture, he joined the Argentinians in their fight, and went with their expeditionary forces to fight alongside the Bolivians and other patriots in several campaigns. In Bolivia, he joined Warnes and was commander of the patriot guerrilla forces in the Vallegrande area, participating in the recapture of the city of Santa Cruz. After some setbacks before the royalists, he had to flee the country and rejoin the Argentinians, reaping more military successes that allowed him to become governor of two provinces at a later date. Once independence was achieved, the political situation in his province of Salta where he was governor caused him to come to live in Bolivia, where he dedicated to farming for the rest of his life. He was a native of Buenos Aires, where he was born in 1770 and studied in the local military academy, graduating as a cavalry officer. When Argentina followed Charcas simultaneously in its rebellion, Warnes was in the expeditionary forces sent to assist Paraguay first and later the Northern provinces comprising what’s now northern Argentina and South/South-eastern Bolivia, plus incursions into Perú. He organised the local patriot forces in Santa Cruz, training them himself, and fabricating the weapons locally as well as decreeing the liberation of slaves to help the fighting, which he did due to the natural isolation of the region that made coordination with other forces hard and left him and other guerrilla leaders to fend for themselves alone after the expeditionary forces of Argentina were defeated and retreated. Outnumbered before the advance of royalist troops, he had to go out and do battle before they reached the still free Santa Cruz de la Sierra; but a cannonball killed him as his cavalry was overriding the royalists, causing his troops to falter at losing their leader and be defeated. His corpse was beheaded and his head was put onto a lance as used as warning to the recaptured city, but one patriot girl named Ana Barba stole it three days later, keeping it hidden till Santa Cruz was finally independent in 1825, when Warnes’ head could be buried. Born in La Paz in 1929 and educated in that city’s Colegio Militar, he is known chiefly for being a military dictator whose taking over the presidency was one of the bloodiest in the country’s history, and also for being the only dictator that’s been brought to justice and sentenced to prison. He was serving as commanding colonel of the Colegio Militar when he became involved in the first of two coups d’état, that of Colonel Natusch Busch, in whose 1979 Junta he served as Commander-in-Chief of the Army. Then, he himself organized another violent takeover that overthrew the only female president of Bolivia, naming himself as de facto president. He stayed briefly in office, during which time he used the military for repression, political assassination, and his corrupt administration is said to have favored illegal cocaine trade. After a long search, he was captured in Brazil, brought to Bolivia to face legal charges, and is currently serving sentence. She was born in Toroca (Chuquisaca) in 1780, and was never formally trained as a military leader but instead was educated at a nunnery school as was traditional for girls of good families during the period. Her strong and energetic personality impelled her to learn horse-riding and saber-fighting with the tolerance of her widowed father, and she became proficient in both at a young age. She married Colonel Manuel Ascencio Padilla, one of the leaders of the Charcas independence uprising, at whose side she fought in the battlefield. She helped form and command the guerrilla unit called Los Leales (The loyal ones), a mishmash of creoles, Guarani warriors and other indigenous militiamen that made life hard for the Spaniards in the La Laguna region. She would take command when her husband was absent fighting elsewhere, and after he fell in battle, she went to join the Argentinian forces like many other leaders and fought under generals Belgrano and Güemes, the former of which awarded her for her victories the rank of Lieutenant Colonel, making her the first and only female commander of the patriot forces with an official military rank. She would stay there until the last year of the war, and returned to Chuquisaca, where she would live in obscurity. Nowadays, she is the only woman in America to have the highest military ranks in existence, General and Field Marshal, each awarded posthumously by the presidents of Argentina and Bolivia in agreement and valid in both countries. He was born in La Paz in the year 1805, and fought under Lanza as a young officer during the independence movement. Later, he’d work in Marshal Santa Cruz’s government, but when he was exiled, he attempted a coup against his successor that failed. 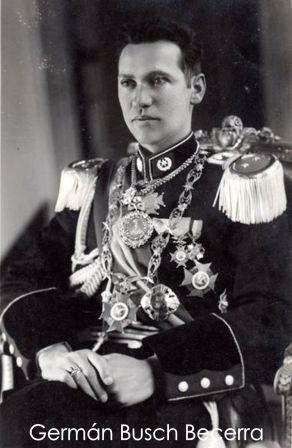 He tried and succeeded a second time, becoming President of Bolivia for six years, during which he developed an intense reformist agenda that improved public policy, the armed forces, the justice system, banking, mining, education, frontier vigilance and exploration of new territories that resulted in the creation of a new departamento (state) named Beni. He was exiled due to combined civilian and military discontentment, and died in Brazil.